If you're just starting to learn about Hall China, these points of interest are all facets of of an Ohio-based company many dinnerware and teapot enthusiasts have come to know and love. If you've known the Hall brand for decades,this list of facts will likely offer an interesting refresher or serve as a starting point for further research. Hall China Company first began production in 1903 in East Liverpool, Ohio making utilitarian wares like jugs, bedpans, and mugs. Thanks to a single fire process developed by Robert Taggert Hall between 1903 and 1911, Hall China is durable, non-porous, and unlike other types of china, it doesn't craze. This is why so many pieces are still around in excellent condition to delight collectors today. The non-crazing process used to manufacture Hall pieces was designed to emulate beautiful wares made in China during the Ming Dynasty, although the shapes and decor do not generally exhibit Asian influence. Institutional items made by Hall in the early days aren't as collectible as the company's later dinnerware, kitchenware, and teapots. Even so, some folks build interesting collections of these items. The word "HALL'S" within a circle marks most items the company made except kitchenware and dinnerware. "Hall's Superior Quality Kitchenware" and "Superior Hall Quality Dinnerware" identify those items respectively. Items found with "Hall" in a bulging rectangle stamped on the bottom were produced from the early 1970s onward. This is helpful to know when distinguishing older Hall wares from pieces that don't have quite as much age. The Hall palette of colors included no fewer than 47 different variations over the years, according to Hall china expert Harvey Duke. Although many people refer to Hall's most popular dinnerware pattern as "Jewel Tea," these dishes originally left the factory without a name. In 1943, the company began referring to the pattern as "Autumn." The name changed again in 1969 to "Autumn Leaf." The first pieces made were teapots, and then dinnerware was introduced. Autumn Leaf dinnerware often made its way into American homes through "The Jewel Man," a door-to-door salesman employed by the Jewel Tea Company of Chicago. This is where the collector's nickname "Jewel Tea" originated. New items were added to the collection through 1980, and the pattern has many fans today. Unmarked pieces featuring "Autumn Leaf" style decals were not made by Hall China, and these imitations generally don't measure up to Hall's quality. They should also be priced substantially less than true Hall pieces. In addition to Autumn Leaf, Hall designed more than 15 other dinnerware patterns decorated with decals beginning in 1936. Hall produced novelty teapots shaped like cars, footballs, and doughnuts that remain popular with collectors although they're quite difficult to find today. 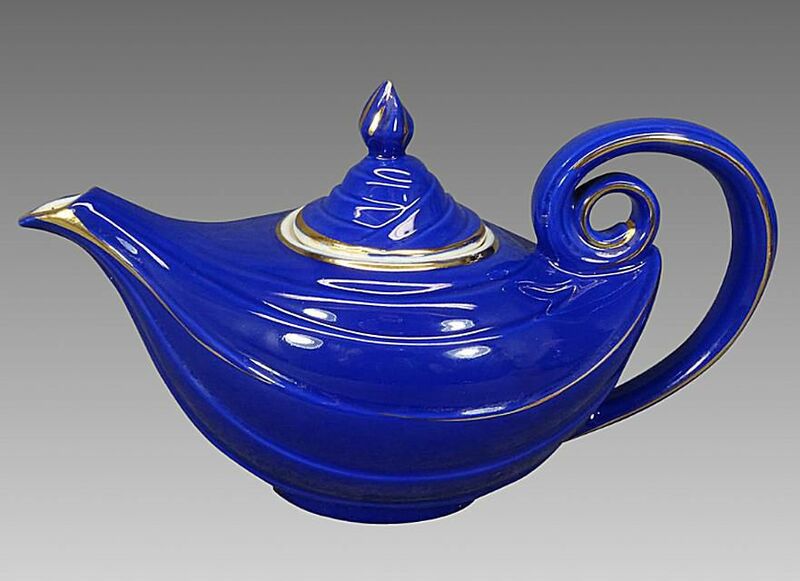 These include the popular Nautilus and Aladdin teapots. The popularity of many of these teapots reflects in their demand and value in the secondary marketplace. More than 160 different shapes and color combinations of Hall teapots appear in The Collector's Guide to Hall China (Collector Books) by Margaret & Kenn Whitmyer. While this reference guide is now out of print, it can be ordered through numerous used booksellers online and it is still a handy guide on the topic for those wanting to learn more. Hall made advertising items for many prolific American brands such as Old Crow, United Airlines, and McCormick Tea Bags, among others. These are sought by collectors who specialize in Hall China as well as fans of varied types of advertising memorabilia. Westinghouse, Hotpoint, and General Electric were among the refrigerator manufacturers who often included Hall water jugs, leftover containers (also know by collectors as refrigerator dishes), and butter dishes as premiums with their products. These items make an interesting addition to a large Hall China collection or as standalone collection of ceramic kitchenware. Hall employed a number of talented designers over the years. One of them was the renowned Eva Zeisel whose work is also associated with the Hungarian pottery company Zsolnay. She is known for designing Hall's Century pattern, the popular Tomorrow's Classic dinnerware, and her namesake tri-colored Zeisel pattern. In more recent history, Hall made a line of wares for the Longaberger Company sold along with their baskets.